jaeger lightweight jacket navy blue size 12. Condition is Used. Dispatched with Royal Mail 2nd Class. Jaeger Navy Blue Jacket. Used but very good condition. Button fastening. The jacket is beautifully cut and in great condition for its age. The photos don't really do it justice. The only faults are splits in the lining under the arms but the rest of the lining is fine. The jacket looks lovely on. A lovely blazer jacket from Jaeger. Size 12. Made from a lined, polyester/wool/elastane blend fabric. V neckline with a single button fastening. Faux pockets. I have many other items for sale, please take a look. Navy Blue & White. Length Front 26" approx. Length Back 27.75" approx. Model is 5"5 & Wears a UK 8. In excellent condition, ready to wear. Great condition. Size 14. Thanks for looking. 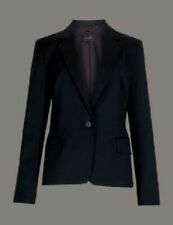 Jaeger grey blazer jacket, with large black fabric covered buttons. It's 85% virgin wool. UK size 16. Sleeve length -24". The jacket was made from two types of fabric - a woven black and navy wool blend and a smooth black stretch viscose blend. Ideal for many different occasions. Gender: Ladies. Arm: 24 in. Sleeve Type: Long Sleeve. Jaeger jacket size 16 76% linen 24% polyester chest 45 inches length 33 inches check out my other items All used items are in good condition unless otherwise stated. It is plain navy blue in colour and is a double breasted style with a classic 4 button with 2 fastening, it has 2 angled, flapped pockets at the front which and has a single split at the back. 1 angles chest pocket and 3 button sleeve. Beautiful vibrant jacket. Versatile wearing. On trend colour. Please note there are some faint marks on the blazer, have tried to picture the worst. Would most likely come out with a refresh clean. Lots of items for sale! Please feel free to have a browse through my other items. Grab a bargain or three! Happy to combine postage but please message me before paying so I can send a combined invoice. I can’t combine after payment. Proof of postage obtained on sending. Any questions or queries please don’t hesitate to ask. Shoulder to hem 23". Armpit to armpit across 19". Amazing Jeager double breast blazer. Stretchy wool blend fabric. Looks stunning with skinny jeans. Occasion Smart Evening Office. Wool Blend. Blazer Jacket. 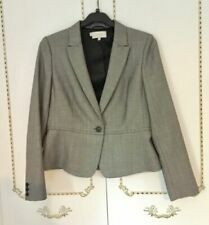 Womens JEAGUR jacket size 6. In excellent condition. It features a V-Shaped neckline and has a button fastening. It is made from a black coloured wool blend material and would be ideal for different occasions. Material: Wool Blend. Exact Material: 98% Virgin Wool 2% Elastane. Lovely herringbone jacket from Jaeger. Half lined. Laid flat - Pit to pit is 23", Waist 40", sleeve is 25", shoulder to shoulder is 17.5" and length is 27". Ideal for many occasions. Material: Wool Blend. Exact Material: 61% Wool, 36% Viscose, 3% Elasthane. Gender: Ladies. Type: Jacket. Colour: Black. Chest Size: 38 in. Weight: 550g. The ultimate in quality, this green soft 83% wool jacket from Jaeger. The pics do not show the colour off to the true beauty of this jacket; emerald green with a royal blue check. Perfect for formal or casual with jeans. Only worn once and cost £165. Size 14 Length 31" from nape of neck. Bust 42" which leaves room for a blouse or fine jumper underneath. A timeless piece that will complement any wardrobe. This is a stylish black and red check wool blend box jacket from Jaeger in a size 16. It is fully lined and does up via a hook and eye at the top and has embroided piping around the edges. It is in good used condition. 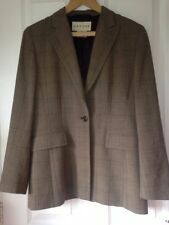 JAEGER Wool Blend Jacket-coat Size 18. Jaeger wrap style belted unblinking jacket-coat,size 18. Pit to pit 22 inc. Length from shoulder 24,5 inc. Length sleeves 25 inc. Side pocket. Jacket after dry cleaning. Good condition. UK only. 19.5" pit to pit. 98% virgin wool, 2% elastane. 21" length. 100% viscose. The coat features a shawl collar, a single button closure, two front pockets and a full lining. Ideal for formal occasions. Material: Wool Blend. Occasion: Formal. Exact Material: 73% Viscose, 25% Virgin Wool, 2% Elasthane. (does run on the larger side so may suitably fit UK 12). - UK 10 / US 8 -. Pit to cuff: 17". 50% Wool, 50% Acrylic. Pit to pit: 20". Ladies Vintage JAEGER Wool Blend Blazer Jacket. 62% Wool 38% Polyester UK 8 Chest measures approx 18" across chest when measured armpit to armpit. Length from shoulder to hem is approx 24" Fully lined but the lining is in need of a clean in places, see photos. Otherwise in nice condition Turn up Cuffs I would say the jacket was on the greenish side in colour. Thanks for looking see my other items for more ladies wear Any questions then please feel free to ask me. Jaeger wool blend blazer in a size 14. Wool blend with a rounded collar. In great condition. The jacket has a small hole on the back (as shown on picture 4), otherwise in good condition. The size faded on the label, but the jacket fits a 10 / 12. 21" across chest. BNWT - Brand New With Tags Beautiful Jaeger coat / jacket in a lovely purple / plum colour, size 10. RRP £399 - grab yourself an absolute bargain! Knee length. Two pockets. Collared with a blazer style top. Slightly flared in the design / cut. Tailored style. Wool blend - 60% wool, 40% polyester. Fully lined with 100% polyester. In immaculate condition. Never been worn outside, only tried on. Will be sent recorded delivery within 3 days of completed purchase. Please feel free to message me with any questions! Size: UK12. 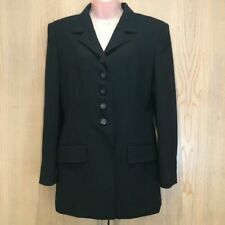 JAEGER Made In UK Black Formal Jacket. Small vent to the centre rear hemline. Material: 94% Wool; 3% Polyamide; 3% Elastane. This jacket is in good pre-owned condition. Note; this is a used item, therefore despite our inspection process there may be minor imperfections. 59% Wool, 39% Polyester, 2% Lycra. - UK 14 / US 12 / EU 42 -. Condition: In immaculate condition with no signs of wear - as good as new! Lovely jacket Blazer from Jeager. size label removed, about UK 10. Really stylish jacket by Jaeger really versatile and easy to wear. Jaeger Brown Wool Faux Leather Jacket. pit-to-pit = armpit to armpit, when flat. 19" pit-to-pit, 28" length, UK 12. length = shoulder to hem, when flat. Write to us, we can sort things out. Opened cases, lead to later blocks.